A cousin of the paywall and skill gate is the social fence. This is where a game, instead of requiring tangible goods for you to proceed, depends on existing or new social connections. Gaming being enhanced by adding friends isn’t a new concept- multiplayer videogames have been around since 1958. Explicitly requiring friendships to progress through a game is, however, a much newer trend. Social Network games such as Farmville and Zynga’s entire catalogue are the most well-known users of this mechanic; spawning multitudes of fans, followers, and imitators. 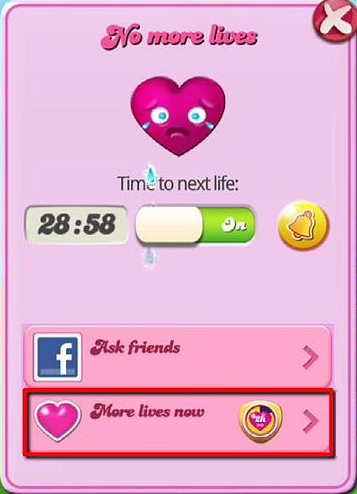 Not forgetting the universal heart-seeking Candy Crush notifications. These games typically work by connecting the energy mechanic I spoke about before with a social mechanic. If a player would initially need to wait 6 hours to continue after running out of energy, a social gate could be created as an alternative. This could be by calling in a friend’s assistance; having a friend start playing the game would cancel that wait. Instead of paying to recover a life, HP can be regenerated from having someone accompany you, while tricky levels can be solved via remote hints from another player. Now we hit a problem, because these abilities are the source of payment in freemium games. If these abilities are social instead, where is the earning potential? Freemium tactics therefore need to be used creatively in these excessively social games. “Creatively”, in this case, often just means using two half-mechanics instead of one major mechanic; Zynga make their money by offering both the ability to ask friends for assistance, and the ability to pay and play solo, but limiting both to the extent that both are required to progress at satisfying speed. Connecting friends to your game also means letting people co-operate or compete. A victory that can be celebrated/laughed at with friends is seen as more meaningful than an anonymous victory, especially to the target casual gaming market. Selling items that provide an XP boost to you, or items that allow you to progress further than your friends, will be an attractive option for more competitive players, or a good way to settle a bet or small rivalry. Co-operation, on the other hand, is for many people the essence of gaming. Giving more co-operative players the option to buy items that can help the whole team, such as a party XP boost, or enhancers for the weakest player so they can be a stronger part of a team, is benefical on two counts. People buying a team item will be socially rewarded for doing so, enhacing their experience of playing. Furthermore, some members of the group buy these items, the other members may feel obligated to join in, to preserve the status quo. This creates a mixture of social guilt and the loss aversion mentioned in earlier posts, leading to people feeling like they need to buy items to “do their bit” for the team. All of this can be done without paywalls or in-game instructions, creating a subtle way to encourage payment from players who wouldn’t pay solo.